Long vs. Short: Can Walmart Compete in Amazon’s World? Walmart long been a company known for doing better when the economy does poorly. Yet amid a historically strong economy, shares in the company are near their all-time high, at $105 a share. The old logic seemed to be in effect when investors sent the shares plummeting last spring after a couple of weak earnings reports — but then WMT came out with impressive numbers in August and the investment community seemed to accept that maybe good times could also be good for a retailer that built its brand on rock-bottom prices. But most important in that quarterly report was a 40 percent rise in e-commerce sales year-on-year — evidence that a series of initiatives and investments on the online front are working. It was a reassuring data point for investors worried about a question that dogs a large percentage of American companies in 2018: But can you compete with Amazon? The good news on the online-sales front also boosted investor confidence in the wisdom of Walmart’s $16 billion purchase of money-losing Flipkart, India’s largest e-tailer. Wall Street now seems eager to see what the retailer can do in the world’s second-most-populous nation. To be sure, Walmart’s business model faces some headwinds. They are under pressure to raise wages — especially after Amazon boosted its base rate to $15 an hour. The company is also among the largest importers of inexpensive goods from China, so the tariffs Beijing is applying to counter those put in place by the Trump administration seem destined to create higher prices — and Walmart consumers are highly price sensitive. Even as most of Wall Street is decidedly bullish on WMT, these questions loom: How will competition with the likes of Amazon and others in the grocery sector play out? Will the trade wars handicap its international growth? We see Walmart going higher thanks to significant investments in e-commerce technology, production, and people. They’re just far ahead compared to a lot of other retailers. Walmart’s grocery business has been a big driver of their digital-sales growth in terms of really going big with their online grocery pickup service. Some competitors are doing that for a fee, and Walmart’s doing that for free is a compelling to customers. When you don’t have to spend that half-hour or hour shopping and you can pull up to a Walmart and have someone put your groceries in your trunk, that’s a big time-saver. Wage pressure is a challenge for a lot of companies, but Walmart got ahead of that in January by bumping minimum pay up to $11 an hour. They’ve also added a lot of benefits. There are three universities they’re offering their associates to attend for a $1 a day. That’s a pretty compelling benefit to retain employees without having to do across-the-board entry-level wage increases again and again. 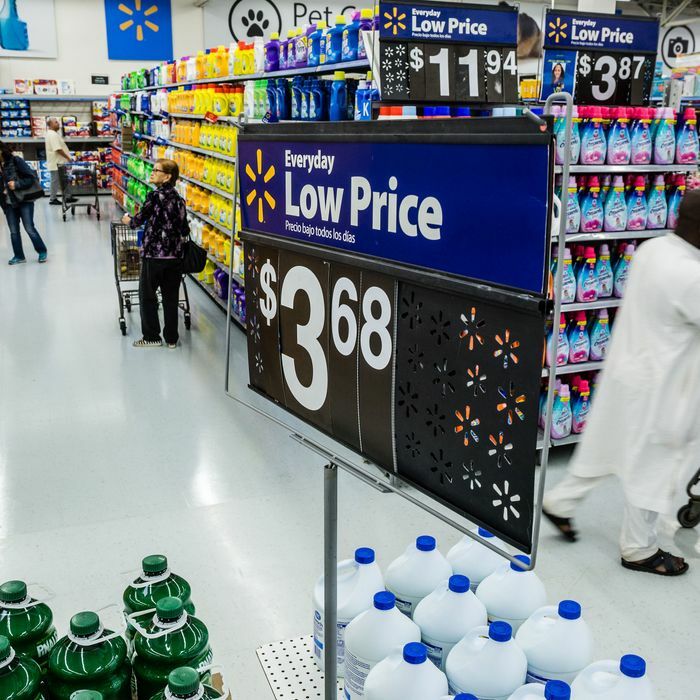 On tariffs, Walmart is a big buyer, but the advantage Walmart has is there’s not a lot of pricing pressure in groceries. Prices are pretty low there right now, so they have a unique ability to balance that because grocery is over half of their business. Also, anybody importing these products is feeling the same pressure, so it doesn’t put Walmart at any disadvantage versus its competitors. It’s a bad time to buy Walmart right now. Walmart is a legacy brick-and-mortar, 100-plus-year-old company that’s trying to navigate a tumultuous environment in terms of geopolitical risks and labor risks — as well as competing with the gorilla in the room, Amazon. The bulls are not baking in enough the effect Amazon and Jeff Bezos can have on Walmart’s future trajectory. The guy just is amazing in every single industry he tries, and there’s nothing stopping him from really tackling Walmart’s core business model. So you see Walmart just started trying to do “buy online, pickup in stores, save some more” — I think that’s the tagline they’re using. They’re sending employees out with packages to deliver to people’s homes. They’re really trying to catch up with how much Amazon has changed the way people shop. Amazon’s big pivot into mass adoption was the $100 a year, give or take, for Amazon Prime. Amazon has reduced shipping costs to where it’s very competitive with just going to a Walmart store to pick things up. Wage pressure is a real problem for Walmart. Within the last three to five years, individual localities and municipalities have implemented higher minimum-wage laws, and we saw Walmart have to either cut staff or pull out of some markets completely because it made stores unprofitable. Meanwhile, Amazon has been proactive in bumping up its wages to $15 an hour minimum. Walmart is more decentralized in terms of store presence and they have a lot more employees making that $11 an hour, so for them to be competitive and give close to a 35 percent increase in wage compensation will fundamentally alter their employment costs.